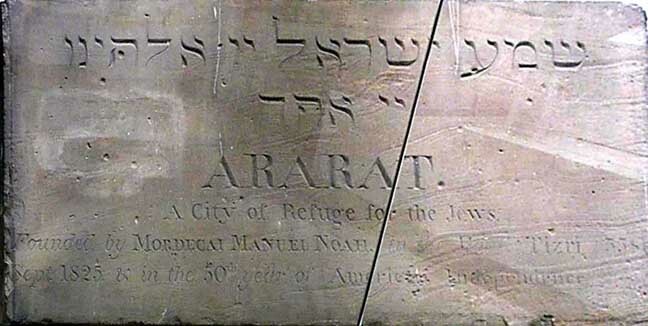 A Jewish settler named Mordecai Manuel Noah tried to launch a homeland for Jews ["Ararat"] on Grand Island in 1825. "In His name do I revive, renew and reestablish the government of the Jewish nation, under the auspices and protection of the constitution and laws of the United States of America," this first American Zionist declared in ceremonies in St. Paul's Episcopal Cathedral. But the cornerstone for this visionary community ended up in the Grand Island town hall, thousands of miles from the state of Israel. Jews arriving after him have made a mark on Western New York that probably would startle Mordecai Noah. Most of the early Jewish settlers were from Germany. The first was Lemuel Flersheim, a teacher in German. In fact, nearly all the Polish families settling here before 1865 were Jewish; they came from the Russian part of partitioned Poland. Polish Jews founded the first congregation, Beth El Synagogue, on Pearl Street. in 1848. German Jews formed the first Orthodox congregation, Beth Zion, at Ellicott and Clinton streets in 1850; it later became Reform Beth Zion. Most of the Jewish settlers before 1860 worked in the clothing business. Then came Jewish tobacco families from Germany. They chose locations on lower Main, Terrace and Commercial Street close to the busy harbor. After the Civil War, In which many local Jewish men fought for the Union, Buffalo's Jews displaced earlier settlers on Franklin, Tupper, Pearl and in the William-Clinton section. By 1890 they numbered 1,500. The city's first corporation counsel was Louis E. Desbecker, who opened the way for other Jews In local politics. As the city became industrialized, Jews moved farther north and east inside the city, and later to the suburbs as well. They prospered in real estate, manufacturing, banking, contracting, in law and in medicine. Many more Jews came to Buffalo after the holocaust of World War II, so that by 1950 there were about 22,000 Jews In the city. Many of their children have gone Into education, unionism and social work to lend a hand to the less fortunate -- a Hebrew trait going back thousands of years. Mordecai Manuel Noah (photo): A quixotic scheme [was] hatched in 1825 by Mordecai Manuel Noah to found the state of Israel on Grand Island. Noah, a playwright and impresario, soldier, adventurer, and diplomat, acquired over two thousand acres on the island opposite Tonawanda. Expansively he invited all Jews to be part of the new nation, and appointed himself a 'judge" of a reconstituted Zion. American Indians, whom he regarded as one of the lost tribes of Israel, also would have a part. The idea sounds preposterous. Setig Adler, historian of the Niagara region's Jewish experience, pointed out that the plan was "not quite as chimerical" as it seemed. The terminus to the Erie Canal was not far away Grand Island also sits between two peaceful countries. Jewish communities worldwide might have contributed capital, settlers, and labor, but there was little enthusiasm and much ridicule In any ease, Noah was better at dreaming than managing. Bad weather kept him from holding dedication ceremonies on Grand Island, and he left without ever having gotten there. In addition to the "Big Four" -- Irish, Germans, Poles, and Italians -- a number of other ethnic and religious groups have made Buffalo their home. Well-educated German Jewish immigrants settled along North, Franklin and Tupper Sts. In 1850, they organized an Orthodox congregation, Beth Zion, at Ellicott and Clinton Sts. From Poland and Russia came thousands of East European Jews -- so many that they soon [by 1915] outnumbered the earlier German Jews. With the arrival of the East European Jews, however, the William Street area became the heart of a new Jewish community. Later this heart shifted north and west to the Hertel-Colvin area. Jews coming to Buffalo after World War II have generally settled there or in the suburbs. Jewish Peddlers: After 1830 the Niagara Frontier settled rapidly [because of the Erie Canal]. The many new households demanded all the little useful utensils, "Yankee notions," and modest fineries that elevated material life in a frontier and boom town. The invention of the department store was decades off, so peddlers supplied these needs. Many of the peddlers were [Polish] Jews. With a small investment in goods, and a sturdy pair of shoes, (later, perhaps, a wagon) peddlers on the Niagara Frontier looked forward to quick returns. Historian David Gerber notes that these were the same people that Germans called luftmenschen because they seemed to be able to live on nothing but air. Jewish peddlers endured anti-Semitism that denied them credit (a special disadvantage to peddlers). Nevertheless Jewish immigrants from Poland prospered in this occupation. Over time they established a stable community. The first Jewish congregation in Buffalo, and the first one between New York city and Chicago, was founded at a meeting of twelve men on 9 May, 1847 in the Western Hotel on Pearl Street at the Terrace. By this time, the Jewish population of the city had grown considerably since the arrival of L. H. Flersheim, the first Jew in Buffalo, some twelve years hence. At this meeting, the men appointed a committee in charge of purchasing land for a Jewish cemetery and for $157.50, they acquired a five acre plot bounded by Fillmore, Batavia (Broadway), Gibson and Sycamore Streets. The young congregation initially worshipped in the Beak Street home of Abraham Jacobs, one of its early presidents. In June, 1848 the congregation became know as Synagogue Beth El or House of God. One year later, they began worshipping on top floor of the Hoyt Block on the northwest corner of Main and Eagle. By 1849, it became evident that a larger place of worship would be needed in the near future. At the January, 1849 meeting of the Jewish congregation, they voted in favor of purchasing a lot on the east; side of Pearl Street north of Eagle containing an former schoolhouse. They devoted the remainder of the year towards raising money with which to purchase the site and remodel the building into a synagogue. With work completed, they dedicated the building during an English language service on 22 July, 18501. The congregation remained here for the following twenty-three years. In January, 1865 a fire in the American Hotel across Main street from the synagogue, the site of the former AM&A's department store, damaged the building. The congregation experienced difficulty collecting its insurance money and began contemplating moving to another location. Despite this period of uncertainty, they made repairs to their building. With many of the original members no longer active, changes began to occur within the congregation. In 1880 the first English sermon was preached and by the end of the century, men and women were allowed to sit together In the same pews. In 1906, under the leadership of Charles Polakoff, the search for a new location commenced. Polakoff had suggested that the new building be located on the west side of the city. But the majority of the congregation lived on the East Side and insisted that the new building be kept within walking distance of the old one. To remedy this the building committee set out on a walk in search of a new site. Setting a leisurely pace, they continued for forty minutes then finding themselves on Richmond Avenue in the vicinity of the current building. On May 2, 1909 the congregation voted to undertake the construction of a new building and purchased the site from the Noye Manufacturing company for $12.000 by the end of the month. They later sold the Elm Street building and site to the Alling, Cory Company for $8.500. 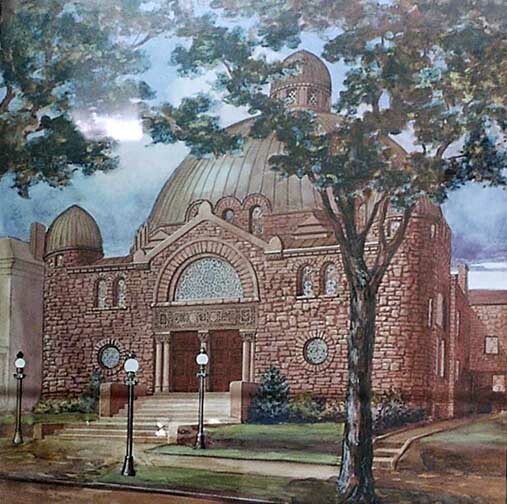 On May 10, 1910 the congregation held their final service in the Elm Street synagogue. While the new building was being constructed, they met in the home of Joseph Saperston at 179 Fargo and then in a hall on Grant at Ferry. 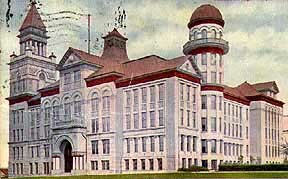 They broke ground on 24 March, 1910, and on 24 July Joseph Saperston placed the cornerstone. They dedicated their $100.000 house of worship on 10 September, 1911. The architect was Howard Osgood Holland. The brick building, with its copper dome, is a familiar landmark on Richmond Avenue. A broad fight a stairs leads to the main entrance doors, the lintels of which feature symbols of the Jewish faith. The auditorium is capped by a dome with an art glass skylight in its center. The congregation worshipped in the building until-the changing demographics of the congregation forced them to consider a new location. In December, 1960, anticipating the move to their new site on Eggert Road at Sheridan, they ended Friday evening services. They celebrated their final service on Richmond Avenue on 9 October, 1966. See also History of Temple Beth El. In late 1923 and early 1924 it became increasingly clear that the Johnson immigration restriction bill, favored by die-hards throughout the United States, would become law. The bill, more so than the legislation of the early 1920s, threatened to end completely the whole character of American immigration. The bill was a direct assault on the eastern European Catholic and Jewish communities in cities throughout the Northeast. A major source of urban vitality was ending. The number of Poles permitted to immigrate dropped from 26,000 to 9,000 a year, Italians from 42,000 to 4,000, Czechs from 14,000 to 2,000, Hungarians from 5,000 to 688, and Greeks from 3,000 to 235. Families, neighbors, and villagers would far less frequently be united on the streets and neighborhoods of America's cities. And yet, for some unexplained and mysterious reason, there was little attempt within these communities, at least in Buffalo, to fight the bill. Of all the city's immigrant groups, the Jews were the most outspoken in their opposition to this patently bigoted legislation. It was not easy to be Jewish in Buffalo in the early twentieth century. Unlike in New York, Philadelphia, or Chicago, where Jews through sheer force of numbers had begun to play an important role in the cities' civic life, in Buffalo Jews, vastly outnumbered, were far less visible. This changed dramatically following the large immigration to Buffalo during the early twentieth century of Russian and Polish Jews. Russian and Polish Jews: The eastern European Jewish population (about thirteen thousand in 1920) had, with their large, Yiddish-speaking families, and their old-world ways, far more in common with the Italians and Poles than with the German Jews on the West Side who had, through success in business and the professions, become some of the wealthier residents of Buffalo. Unlike the German Jews, who blended easily into the city's social fabric, the Jewish east siders were eminently visible. The Jewish community, particularly the Russian and Polish Jews on the East Side, had been cohesive and well organized from the very beginning, with a full range of social, religious, and cultural activities and institutions. There were close to a dozen synagogues, several newspapers, literary circles, Zionist and labor organizations, and a theatre known as The Little Theatre which specialized in pacifist and socially conscious agit-prop. Now. for the first time, there emerged a group of young men and women, east siders and west siders, who were willing to go public as Jews, to present themselves to Jews and Gentiles alike as "Jewish Leaders." It was a risky business. Joseph Braun: One of these was Joseph Braun. Joseph Braun, thirty years old in 1924, the year of the Johnson Immigration Restriction Act, was president of a small yet quite successful insurance business, most of whose clients were Gentiles. Born in Buffalo into a first-generation German Jewish family, Braun, who had grown up in the prosperous, Protestant social environment of the West Side, had many friends in the non-Jewish community. He belonged to an organization of downtown businessmen and a downtown luncheon club, and was an active member in the Buffalo Rotary. 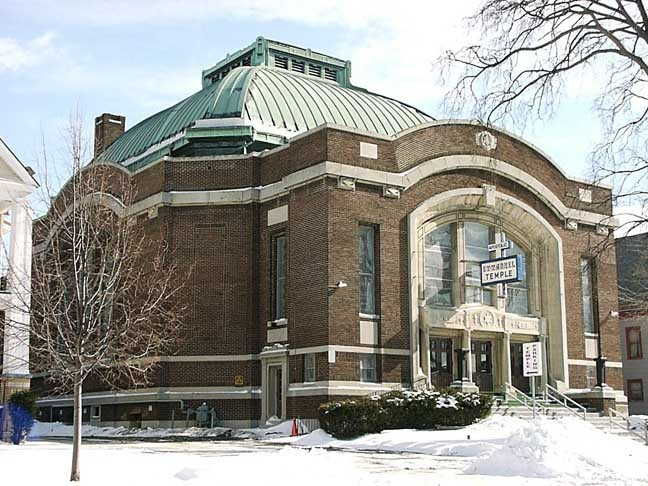 Although raised in a traditional Jewish household, Braun had for years belonged to Temple Beth Zion, a Reform and largely German Jewish congregation. Other than his annual attendance at High Holy Day services, Braun was casual about his religious affiliation. Being Jewish, he felt, played an insignificant part in his life; many of his Gentile friends didn't even know he was Jewish. Life began to change for Braun after World War I. In 1918 Buffalo's first Jewish newspaper was published. In 1919 the newly organized Federation of Jewish Social Services opened its headquarters in a downtown hotel. A Jewish old people's home was built in the heart of a prosperous, Presbyterian neighborhood. Zionists like Felix Frankfurter and Chaim Weitzman came to Buffalo to talk about Zionism, a subject long frowned upon by the city's German Jewish establishment. The Jewish community was coming out. Never more visibly than in 1924 when, more vocally and critically and more actively than any of the city's immigrant groups, Jews (much to the dismay of some of the city's German Jews, who would well have welcomed the exclusion of their scruffy, Polish and Russian Yiddish-speaking brethren) protested the Johnson immigration bill of 1924. Unlike the mild, restrained rhetoric of the Catholic Union and Times, Everybody's Polish Daily and the Italian Corriere, the Buffalo Jewish Review was frank and blatant in its attack, openly denouncing "these Nordic theories of racial supremacy," and calling the bill "anti- Semitic, anti-Catholic and anti-American." Responding to the challenge of the bill, Braun, who had recently led a citywide fund drive for the Jewish Federation, now began the task of organizing the entire immigrant community of Buffalo against the bill. Working with two Polish and one Italian priest (the bishop of Buffalo refused to participate), Braun organized a citywide protest demonstration against the bill, With the support of the mayor and the common council, which passed a unanimous resolution against the bill, Braun and the others were able to attract an audience of over two thousand Jews, Poles, and Italians to Buffalo's auditorium. The Jewish Review noted: "The Broadway Auditorium last Sunday presented a scene that was unique and inspiring, Three groups that hitherto have been separate have united in a common protest against the Johnson Immigration Bill,"
Their protest failed, however, and the bill became law, Buffalo's immigrant population was now shut off from its forebears in eastern Europe, Denied rejuvenation from the outside, it was simply a question of time before these communities would begin to wither and die. Many of the older, inner-city ethnic neighborhoods had already begun to decline during the 1920s. Even though Buffalo's population was growing very quickly (it increased by thirteen percent between 1920 and 1930, to 573,076), most of the older inner-city neighborhoods had begun to lose population. There was then an enormous amount of upheaval in the city's neighborhoods, with thousands of people pouring in and thousands leaving. None changed quicker and more dramatically than the lower East Side. The lower East Side had been to Buffalo what it was to New York City: the neighborhood of entry for everyone of the city's immigrants. By 1915, the area bounded by Michigan, Jefferson, Broadway, and William Streets had lost most of its original German population and was now inhabited primarily by Jewish immigrants from Russia and Poland. But for them, as well as for the other immigrant groups who had lived there, the East Side neighborhood was only a temporary home. While suburban-bound second-generation Americans waxed nostalgic about the old neighborhood, little love was actually lost on it. Indeed, they got out as fast as they could. During the 1920s many of the Jewish residents of the East Side, some of whom had been there for less than ten years, began to move to newer and nicer neighborhoods in more northerly sections of Buffalo. It was inevitable that these first-generation immigrants, both Jews and non-Jews, left. As the number of blacks grew -- the local grammar school had 607 black students in 1925 and only 90 in 1920 -- Jews left, The East Side Jewish community was dying. Interrupted by the Depression and then by the Second World War, its death was slow. But by the early 1960s it had vanished completely. The Expressways: What was needed, it was felt, was a highway from east to west within the city. Not only would this provide a direct link between the city and the new eastern suburbs, but it would bring the airport within direct and easy reach of downtown Buffalo. Thus in 1953 state and city planners outlined their proposals for the construction of five highways which would cut through the city along five different east-west axes. Thus, superimposed upon the street system of the city of Buffalo would be a monstrous gridiron consisting of five superhighways whose purpose would be to join the rapidly growing surrounding suburbs with a rapidly declining central city. The price they paid for this plan was enormous; the damage irreparable. It didn't look that way at first. In elaborately illustrated and documented brochures, these expressways were presented to the public in 1953. The views of these neighborhood. and street-obliterating highways was always from the air, and from a distant, bird's eye view they looked clean and benign. Sprinkled here and there with cars, lined with rows of thickly planted trees, the highways looked small, harmless, and almost bucolic. The reality was far different. The first link in the system of east-west highways was the Scajaquada Creek Expressway. It began at the thruway on the west side of the city and then made its way east, where it connected with the Kensington Expressway, the second link. The Kensington carried the system directly to the eastern suburbs on one spur and into downtown Buffalo on the other. The Kensington bulldozed through a neighborhood; the Scajaquada through a park. Both areas were expendable. Humboldt Park: The neighborhood was known as Humboldt Park, named after the Olmsted-designed park it was near. Like Buffalo's lower East Side during the 1920, the Humboldt Park area was in a state of transition. Still predominantly Jewish and German, it was quickly becoming black. But for now, at least, it was an integrated, stolid, substantial middle-class community of one-and two-family homes on tree-lined streets, the best black neighborhood in Buffalo and, though not the best, still a desirable Jewish neighborhood. Yet 1ocated as it was directly in the middle of the proposed route to the suburbs in the east, few planners questioned the wisdom of building a major highway through it. After all, there was a parkway already there, and if by converting that into a six-lane grade-level highway (depressed on part of its route) the airport and the suburbs would become suddenly accessible, the price was worth it. What's more, there was little opposition. The Jewish residents had already begun to abandon the community, and while many of the incoming blacks opposed the plan, they, among whom were many professionals and business people, had not yet acquired the political power that they would have at a later time. The Kensington had far more proponents than opponents, and in the early 1960s construction on it began.